The First World War was the single most important event of the twentieth century. Every event that followed that war, all the other wars, the great movements and revolutions, and even the scientific discoveries and inventions, began in some way, direct or indirect, from the great and terrible happenings of the years 1914-1918. A world in which that war had not occurred would be a very different and perhaps better world. Despite the importance of World War One, I have never known very much about it. I had some knowledge of the general outlines, which countries fought on which side, and which side won. I knew the names of some of the battles, the Somme, Verdun, but nothing in detail. I had some familiarity of the conditions of the Western Front but knew almost nothing at all about the Eastern Front, save that Russia ended up losing. I do not think that I am alone in knowing so little about World War One. The First World War tends to be overshadowed, in contemporary minds, by the still greater and more catastrophic Second World War. Yet, had the first war not been fought, it is very unlikely the second war would have broken out. At first the nature of the combatants would have been different, no Nazis in Germany and no Communist Soviet Union. In the United States, World War One tends to get little attention because we only entered the war in its last year. While the US contribution was crucial to the Allied victory, the war did not hurt us as badly as it did the European powers that fought it. Unlike France, Germany or Britain, America did not lose much of a generation in the fighting. To learn more about this war, I turned to The First World War by the eminent military historian John Keegan. I am happy to report that Mr. Keegan does a truly marvelous job in relating the course of the war, from its beginnings, in the plans by the military staffs of the various combatants to fight the next war, to the assassination of Franz Ferdinand that sparked the war, through the years of trench warfare when massive armies butted heads to no avail, all the way to the last desperate attempt by the Germans to knock Britain and France out of the war before fresh American soldiers arrived to reinforce them. He seems to pay equal attention to both the Western and Eastern fronts. I learned quite a lot about the fighting between Russian and the German-Austrian alliance, not to mention the fighting in the Balkans where the war started. Keegan mostly dwells on the military aspects of the war and has relatively little to say about the domestic politics of the European nations. He does go into some detail about the diplomatic maneuverings the nations of Europe engaged in during the Balkan crisis that led up to the war. It is somewhat poignant to learn that neither side really wanted a general war in Europe, but no one seemed strong enough to end the crisis. Keegan speculates that if Austria-Hungary had launched an immediate invasion of Serbia in retaliation of their support for terrorist activities, the crisis would have ended before it had grown out of control. As it happened, Austria-Hungary waited for support from Germany, and the wait proved fatal for Europe. Keegan challenges some myths and ideas that have grown up about the war. He argues that the various generals were not as incompetent or unconcerned about casualties as is often supposed. As he points out, they tried to fight the war as best they could, but technological development was at an awkward phase for fighting a war. Barbed wired and the machine gun made defended positions nearly impregnable, while the technologies that would have aided the offensive, tanks and airplanes were only beginning to be developed. Improvements in transportation, especially trains, made it possible to send many thousands of men into battle, but the generals had no way to keep in contact with their armies once battle had begun. It was no longer possible for generals to lead their men in person; the battles were too large for that. Telephone and telegraph wires were easily cut. Radio was still in its infancy. The generals were removed from the battlefields because they had no choice. They sent their men to be slaughtered because wars cannot be won without attacking the enemy and attacking the enemy’s positions killed thousands. 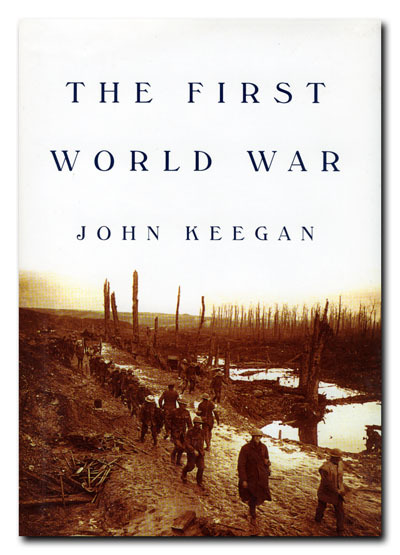 I enjoyed learning about World War One from John Keegan’s book and I think it serves as an excellent introduction to the war. It covers all the major battles and aspects of the war without getting bogged down in details. Best of all, it can be understood easily even by the reader not familiar with military affairs. I can highly recommend The First World War. This entry was posted on February 12, 2015 at 7:54 pm and is filed under Books I've Read, Foreign Affairs, Heroism, History. You can follow any responses to this entry through the RSS 2.0 feed. You can leave a response, or trackback from your own site.